A hundred years ago, educators rightly understood that hearts must be warmed before minds can be taught. The gift of story, art, and music are the primary tools of a heart-based education. Our top choice resource that can be used to guide parents and teachers through this type of education is The Forgotten Classics from Libraries of Hope. Option 1: We offer a choice of two different types of study. The first study guide provides resources by monthly themes and children have an opportunity to discover the story of each country. You will find this free resource at Libraries of Hope. These resources may be used year after year for an in-depth study of history through adulthood. Several resources are listed under monthly themes. Parents and teachers can choose which resources they want to use each month that are age appropriate for their children. 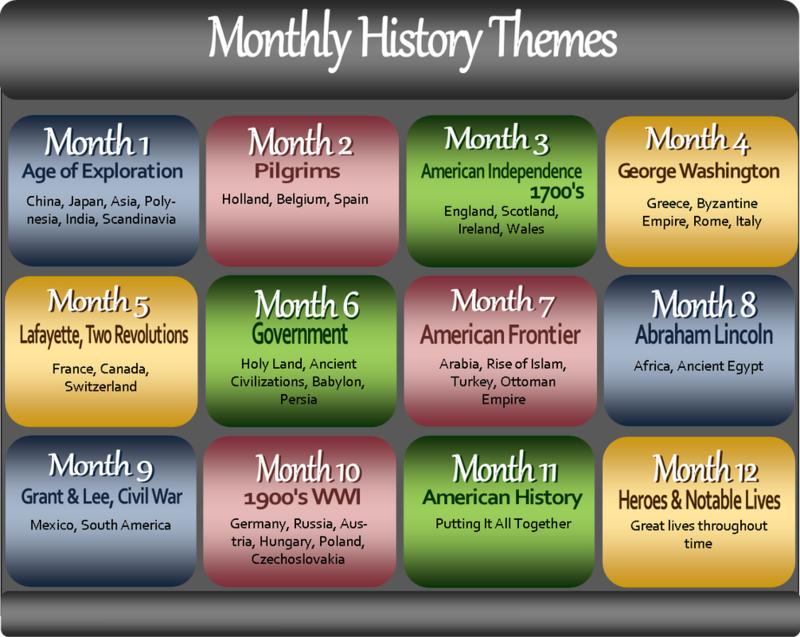 Monthly themes are based on stories of American History which link to other stories that have transpired all over the world. Option 2: The second option is to study history by time line and anchor dates. Free downloads of the History Stories Study Guides are available here on Hearthstone. Stories in the guide include the Forgotten Classics from Libraries of Hope as well as stories from Kimber Curriculum, The Good and the Beautiful, and The Family School. Many of the stories in the Story Guide can be accessed free on internet archives through the Libraries of Hope website. The foundation texts are available as physical books for purchase. This is an excellent and very cost-effective resource for families. The Story Guide offers many suggestions for stories, music, plays, and movies to use in conjunction with the monthly themes. Families may return year after year without concern of running out of material. This technique of establishing monthly themes to be revisited year after year is an excellent organizational technique to allow children of all ages to participate in family story hour and to receive a well-rounded understanding of history. See our Family Style History page for more information on following a time line history schedule. If families choose a timeline history rotation schedule, we recommend they consider using the fabulous resources at Libraries of Hope. The Introductory Course and Mother's University on the Libraries of Hope website provide valuable instruction about notebooking, nature study, and incorporating music, art, poetry into your family learning activities. These learning techniques can be easily incorporated into the rotation schedule of your choice.